Q.1 How does a diffusion pump work? Ans. A diffusion pump works on the principle of gas diffusion to create vacuum. 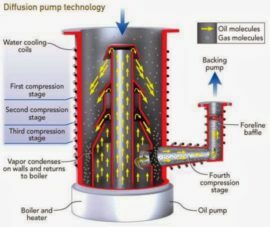 In a diffusion pump, diffusion pump oil is heated to its boiling temperature. Vapor of this oil is compressed in a vertically tapering hollow cone as it moves up. Simultaneously this oil vapor escapes from jets along the height of hollow cone. Oil vapor escaping at great speed traps air and then collides with water cooled wall of Diffusion Pump and moves down. Trapped air is released at bottom of Diffusion Pump. This creates differential pressure in diffusion pump. Pressure at top is minimum (high Vacuum) and at bottom is maximum (low Vacuum) from bottom of diffusion pump the air is sucked by rotary pump. Q.2 Is a diffusion pump made only in cylindrical shape? Ans. Diffusion Pump has been successfully made in rectangular shape also. In fact rectangular shaped Diffusion Pump has an advantage that its inlet connected to Vacuum Chamber can be of larger area and Diffusion Pump itself can be adjusted to occupy less space. This also works with Diffusion Pump Oil as a working medium just like cylindrical Diffusion Pump. Q.3 I understand that Turbo molecular pump (TMP) is an alternative to diffusion pump. Is it better or worse than diffusion pump? Ans. Turbo molecular pump works on the principal of positive displacement. In this pump a series of inclined blades are mounted on a shaft which rotates at very high speed. These are called Rotors. Fixed blades or stators are fixed in such a way that Rotors and Stators alternate. Because of rotation of shaft and incline rotors push air down to next row of Stators. Stators too are inclined in same direction and push this air to next row of Rotors and so on to exit, where a Rotary Pump draws away the air. Though this pump creates good vacuum and can be used in place of Diffusion Pump but its applications are limited to critical applications like semiconductor coatings. 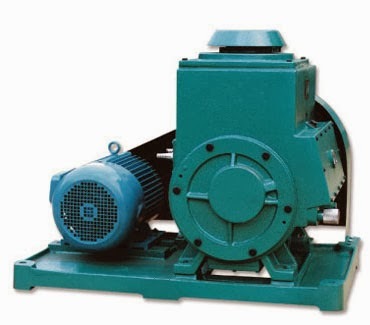 This is because of its high cost, more requirement of maintenance and the fact that since this pump cannot be made of large size because of mechanical considerations, a diffusion pump can be replaced only by a couple of Turbo molecular pumps. Diffusion Pump on the other hand has no moving parts and requires almost no maintenance other than Diffusion Pump Oil change, is cheaper in cost and can be built in almost any size. Q.4 Why is topping up required for Diffusion Pump Oil? Ans. In a Diffusion Pump, DP oil evaporates to produce diffusion action. Since oil is in vapor state so part of it is lost by leakage, some of this oil vapor is also sucked away by Rotary Pump. It is therefore important that lost diffusion pump oil is leveled up by topping. Not topping up will result in overheating of the remaining oil and loss of oil as explained above will further speed up, causing a drop in vacuum. In extreme cases Hydrocarbon Diffusion Pump Oil may burn to tar like substance and Silicone diffusion Pump oil may turn into grey colored crystals. Read about diffusion pump maintenance here. Q.5 Why can a diffusion pump not work alone and requires a rotary pump as backing pump? Ans. A diffusion pump merely creates a vacuum gradient where top of diffusion pump has a higher vacuum and bottom of diffusion pump has much lower vacuum. A diffusion pump has no moving parts to force air out, so though lower portion of Diffusion pump has a low vacuum but since it is still better than atmospheric pressure so air will not flow out. 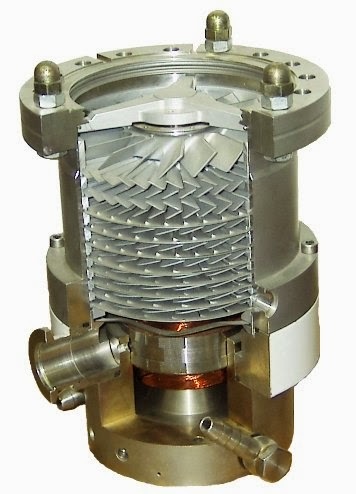 This lower portion of diffusion pump is connected to rotary vacuum pump. Since vacuum in lower portion of Diffusion Pump is lower than what Rotary Vacuum Pump Oil is able to create so Rotary Pump evacuates the diffusion pump and diffusion pump is able to work. Q.6 How can I get more life from my expensive Diffusion Pump Oil? Ans. Diffusion pump oil is one of the costly consumables of the metallizer. With a few precautions, its life can be prolonged and money saved. Never open the pump when the oil is still hot. Exposing the hot oil to air changes its viscosity, making it thick gel-like. Take care to top up the oil in the pump in a timely way so as to avoid accidental over heating of the oil. Keep a timely watch on the pressure and heater gauges. Back streaming of vapors from the vacuum chamber and/or Rotary pump letting its vapors in to the Diffusion pump are two reasons for the DP oil to get contaminated. This can be prevented by installing filters above the chevron baffle of the DP and on the line in between the rotary and the diffusion pump. These filters must be cleaned from time to time. Silicone DP oil decomposes on coming in contact with even trace elements of alkali metals e.g., sodium, potassium, cesium etc. Do not allow them and/or their vapors to come in contact with the DP oil. Keep a check on the water flow through the cooling lines for proper cooling of the hot oil inside the diffusion pump. Q.7 Do I need to open & clean jets of my diffusion pump every time I change oil in it? Ans. If you are using a good quality silicone diffusion pump oil then there is no need of cleaning jets every time you change oil cleaning be done once in 4 to 5 years. However if you are using hydrocarbon diffusion pump oil then cleaning is a must every time you change oil. Q.8 Is DC-702/DC-704/DC-705 Diffusion pump oil still available? If not then what is the alternative? Ans. 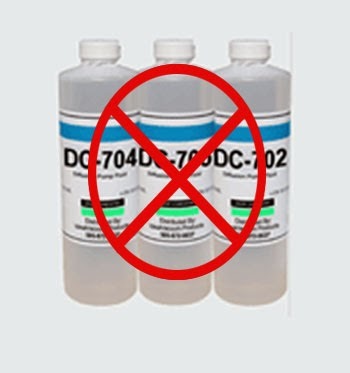 DC-702/DC-704/DC-705 – these oils are no longer available in the entire world as the manufacturer Dow corning stopped the production of these oils more than a year back. 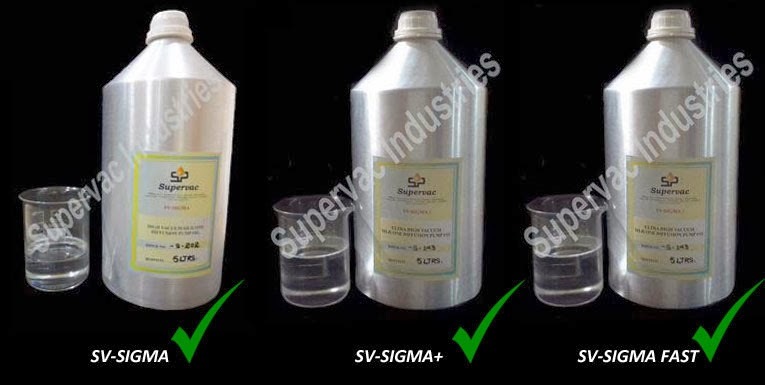 Supervac Industries supplies SV-SIGMA, SV-SIGMA+ and SV-SIGMA FAST as alternatives of DC-704, DC-705 and DC-702 respectively. These oils are being used by a large number of customers in more than 20 countries. Q.9 I observed whitish deposits in my diffusion pump. What could this be? It is serious? Ans. On overheating silicone diffusion pump oil turns into whitish grey silicone crystals. Yes, this is serious. You need to check cooling for diffusion pump and also make sure that level of diffusion pump oil never falls below minimum level. This requires topping up from time to time. Also a faulty temperature gauge not allowing heater cut-off to take place, can be responsible for the oil over heating. Q.10 What is back streaming in diffusion pump? Ans. If the pressure is too high in the diffusion pump then the emerging diffusion pump oil vapor from the jets trying to move down collides with air molecules in the pump. This results in no vapor going down the pump. Contrary to this, the vapor itself starts rising up the pump along with the air and raises pressure instead of reducing it. This undesirable process is called “back streaming”. Because of back streaming Diffusion Pump Oil can travel to vacuum chamber or can even be removed by Rotary Vacuum pump. If it enters Rotary Pump then it contaminates Rotary Vacuum Pump Oil also.